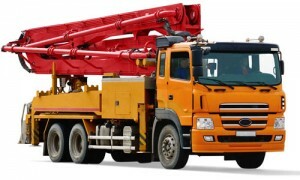 If You Need To Finance a New or Used Concrete Pump Truck, Look No Further! If You Have A Quote For Financing In Hand, Give Us A Chance To Beat It! Concrete pumping trucks are a major investment that need to be set up with the right financing structure in order to best fit into both your cash flow and balance sheet. If you are buying directly from a dealer or manufacturer, there is a good chance that they will provide you with an in house financing option, but that certainly doesn’t mean its the best option available to you. The reality is that in some cases, the cost of the unit can be significantly less if you purchase in cash, or finance through a different source than the dealer program. This is why its not always a good idea to focus on just the cost of financing as the much larger cost is the cost of the concrete pumping truck itself. By focusing on an independent source of financing you are in a much better position to get both the best truck purchase price and the best financing rates and terms. The cost of getting a financing quote is fast, totally free of charge, and comes with no obligation. Our goal is to help you get the right financing option for your concrete pump truck acquisition and get the deal funded as quickly as possible to you can get it to work.